CaratsDirect2u uses the latest photo technology to photograph its loose diamonds and diamond jewelry in 360 degrees. The quality glass macro lenses captures every single detail so that our customers can see exactly what they are buying. Inspect the items that you are interested in from every possible angle at 15x or more magnification. You can take your time to inspect the loose diamonds and diamond jewelry without an impatient salesperson hovering over your shoulder. You can clearly see the diamond inclusions in our loose diamonds. Many inclusions are hardly visible to the untrained eye, even with a jeweler’s loupe. Inspect the back sections of the jewelry. We want our customers to be happy with every part of the jewelry, even the parts are not usually visible. Shop online with confidence. The 360 degrees videos will show you exactly what you are buying, so you will not be disappointed when you open your package. 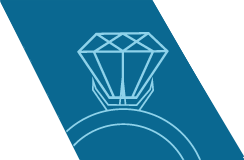 As an online e-commerce company, we are very aware of the fact that our customers cannot feel or try on the diamond jewelry that they are interested in buying. That is why we are happy to offer a 30 day return policy and take the time to photograph our diamond jewelry from every angle. You might not be able to slip one of our diamond tennis bracelets over your wrist immediately, or straight away try on one of the our amazingly designed rings but you are definitely able to inspect our jewelry thoroughly. The zoomed-in 360 degree videos of our diamond jewelry clearly show the high-quality finish, the cut of the diamonds as well as how the jewel designer decided to set the stones inside the precious metals. So if you are thinking of buying a loose diamond or like a pair of diamond earrings, use your mouse or the buttons at the bottom of the 360 degree videos to rotate, enlarge and thoroughly inspect our diamond jewelry.